I get so frustrated when trying to determine where to start when a user comes to me and tells me that "the database is slow". Launching Performance Monitor and running a trace in Profiler is inefficient. Unless I know what I'm looking for to begin with it's hard to narrow things down using those tools! Do you have any suggestions for quickly determining if I should be looking at CPU, Memory, or I/O issues without the needle v. haystack dilemma that comes with diving right in to Perfmon and Profiler? wait_type - the type of wait being encountered, the current list of wait types is available from Microsoft here. 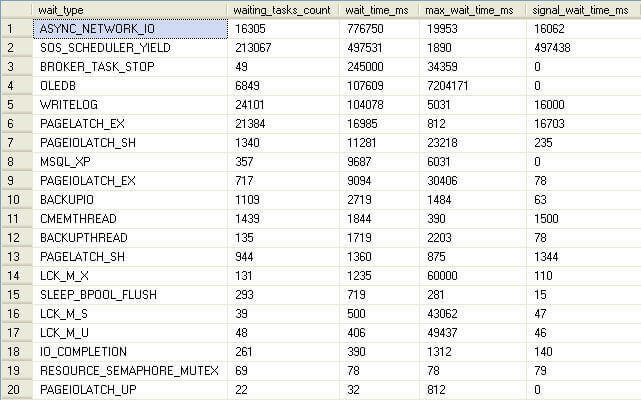 There are currently 201 wait types in SQL Server 2005; 485 in SQL Server 2008 as of SP1. waiting_tasks_count - the cumulative number of tasks that have registered this wait since the last time SQL Server services were restarted. wait_time_ms - the cumulative amount of wait time registered for all tasks encountering this type of wait since the SQL Server services were restarted. max_wait_time_ms - the maximum wait time for any of the tasks encountering this wait since last SQL Server service restart. signal_wait_time_ms - the amount of time, in milliseconds, any request waited after being signaled that the resource was freed, until a worker was assigned to handle the request. A high signal wait time is indicative of CPU issues in that the thread still had to wait for CPU assignment even after the resource being waited on was freed up. I made mention above that the information is cumulative for this DMV. This information is held in cache. It will be lost/reset upon services restart. If you want to maintain history for this metadata you may want to consider persisting the information in a physical table. More about that later in this tip though. Looking at the sample output you'll see that results are returned for each wait_type, regardless of whether or not there were any cumulative tasks that waited on resources for that specific type. You can also see that lock types are included in the output of sys.dm_os_wait_stats. A general query of this type doesn't really tell us much though. It's the other things we can do with this DMV that are telling. In this case you'll see that since the last SQL Server services restart, I'm primarily dealing with ASYNC_NETWORK_IO and OLEDB waits on my SQL Server instance. I know there to be issues with a specific application on my server that causes these waits due to performing row-by-row processing of SQL batch results sets returned to the application. The SOS_SCHEDULER_YIELD wait occurs whenever a task offers up its place in queue to allow another process to run in its stead. It is indicative of CPU issues that may need to be addressed. Specific waits will point you in the direction of where to focus your tuning resources because the cause for certain waits are attributed directly to CPU, memory, or I/O. The PAGEIOLATCH_... waits are indicative of I/O issues, as is WRITELOG. CXPACKET is an indicator of waits due to queries going parallel and running across a number of CPU cores. I strongly suggest following the Microsoft CSS Team's blog and reading through the number of entries associated with wait types for the continual evolution of precision tuning using sys.dm_os_wait_stats. The important thing to remember is that the metrics for the columns returned when querying sys.dm_os_wait_stats is cumulative. Like all Dynamic Management Object information these values accumulate over time and are wiped-clean at a SQL Server service restart. This is why I mentioned persisting the information in a static table on a dedicated administrative database located on each managed SQL Server instance. You can then query the information just for the period between the last two stats collections. I use a SQL Server Agent job that runs hourly to persist the information to the static table. You could either run the code manually when desired or schedule as works best in your organization. The query is lightweight, not really too noticeable on a decently-sized server. The template script below will allow you to do just that. Note that the remaining scripts in this post use template notation. CTRL+SHIFT+M in SQL Server Management Studio will provide a form to enter parameter values that are correct for your environment. Finally, you could re-tool the earlier top N% waits query to examine just the most recent wait stats activity from the persisted table as demonstrated below. You can utilize this process (building a CTE comparing deltas for just the activity collected since the last two polling periods) to retrofit any query you find online for analyzing results from sys.dm_os_wait_stats. As you encounter performance tuning issues, consider the scripts in this tip to begin to refine your scope to solve the issues. Follow the Microsoft CSS Team's Blog here. The concept of Dynamic Management Objects was mentioned in this tip. Tips about DMVs are available here. I am not a database administrator but I have a task to get the total blocking time of a session. Your tutorial above is very well explained. I am just wondering if it is possible to change it, that instead of wait_type, it will be SPID. And the wait_time_ms would be the total time an SPID has been blocking sessions. The running percent column is used to show you the overall percentage used for each of the wait stats in the group. The HAVING clause is used to limit the amount of rows that are returned to only those that are the most consuming resources. The information that is returned will give you an idea of what WAIT STATS are causing delays in SQL Server. So in Tim's last example ASYNC_NETWORK_IO is 33.98% of the overall waits. So you then need to take that info and do research on what ASYNC_NETWORK_IO is and how to resolve that issue in SQL Server. These high level values that you then need to dig deeper into. I have been reading your article on https://www.mssqltips.com/sqlservertip/1949/sql-server-sysdmoswaitstats-dmv-queries/ today and I am unable to grasp the reason for calculating the running_pct column in that way and then the HAVING clause is also puzzling me. Can you explain it in simpler terms for me and also how do these values help me to determine the cause of the poor performance issues. I've been using your code for several years. I have a job to persist the wait stats in a table and then use the analysis query to get the stats and percentages over a given time interval. It's one of the most useful things I've ever found. Today I noticed something interesting. For a given time interval and a specific wait type, the wait_time_ms value can exceed the interval time. For example, if I am looking at waits for the past hour, I can see that wait_time_ms for a specific wait type is 157 minutes. I think I know why this is, but I wanted to run it by you: The server in queston has 8 NUMA nodes and there are different tasks running on each node. Each node must rack up its own waits. Does that make sense? Can you explain the pct and running_pct columns, I am having a dificult time figuring it out. Thanks for the great queries. "I do not know how to interpret this. Can you help me?" My reply is 7 months late, but I will take a stab at answering (for the sake of the blog). We do not know whether the presented metrics reflect a specific period of time during which a problem was known to be occurring (over the majority of that time period), whether the metrics reflect a period of time during which a much briefer problem period may have occurred, or whether the above metrics simply reflect has happened since SQL Server was last restarted or since these metrics were last cleared (AKA the metrics reflect no noticeable problem). Wait types are accumulated by hundreds (if not a thousand) worker threads running in parallel. There are both interdependencies and independencies between wait types. What those threads are doing depends upon what T-SQL clients are submitting (and when), at any given moment. It is important to concentrate upon the dm_os_wait_stats while a problem is happening, but it is equally important to avoid considering dm_os_wait_stats when no problem is happening. The caveat: It is nice to have baseline data (captured during a time when no problem was happening) for comparison purposes. No system (SQL Server, mechanical, or electrical) is infinitely fast - every system is always waiting on some wait_type. You will face a Herculaen task if your goal is to “eliminate all waits.” Invariably, it is a human judgment that decides when a piece of string (a wait type) is “too long”. Choose your battle wisely :). BROKER_TASK_STOP == "Occurs when the Service Broker queue task handler tries to shut down the task. The state check is serialized and must be in a running state beforehand." Also see http://blogs.msdn.com/b/sql_service_broker/archive/2008/12/01/service-broker-wait-types.aspx. BROKER_RECEIVE_WAITFOR == "Occurs when the RECEIVE WAITFOR is waiting. This is typical if no messages are ready to be received." Also see http://blogs.msdn.com/b/sql_service_broker/archive/2008/12/01/service-broker-wait-types.aspx. WRITELOG == "Occurs while waiting for a log flush to complete. Common operations that cause log flushes are checkpoints and transaction commits." SOS_SCHEDULER_YIELD == "Occurs when a task voluntarily yields the scheduler for other tasks to execute. During this wait the task is waiting for its quantum to be renewed." BACKUPIO == "Occurs when a backup task is waiting for data, or is waiting for a buffer in which to store data. This type is not typical, except when a task is waiting for a tape mount." PAGEIOLATCH_SH== "Occurs when a task is waiting on a latch for a buffer that is in an I/O request. The latch request is in Shared mode. Long waits may indicate problems with the disk subsystem." The WRITELOG wait_time_s indicates that frequent log flushes are overwhelming (queuing) the logs' disks. See http://blogs.msdn.com/b/sqlsakthi/archive/2011/04/17/what-is-writelog-waittype-and-how-to-troubleshoot-and-fix-this-wait-in-sql-server.aspx (you will need to find that blog's referenced an d important SQLCAT document, because the SQLCAT team has moved their URLs to msdn). The BACKUPIO 12,172.66 wait_time_s is about 1/3rd of SOS_SCHEDULER_YIELD's 34,304.94 wait_time_s. I believe there is qualitative point where a DBA should not worry about "diminishing returns". Worrying about BACKUPIO can be "making a mountain out of a mole hill", especially when "there are bigger fish to fry". The same applies to PAGEIOLATCH_SH. Assuming the dm_os_wait_stats metrics reflect a specific period of time during which a problem was persistently occurring (for the majority of the time period), I think you should solely concentrate upon the causes of WRITELOG. You can and should revisit the other wait types, with new data in hand, later (i.e. their ranked importance can change, after you address WRITELOG). For WRITELOG, the SQLCAT reference covers inadequate disk performance, while the above msdn blog covers the impact of excessively chatty singleton updates, deletes, or inserts. Use the perfmon counters identified within the SQLCAT reference to investigate inadequate disk performance. More broadly: Use sqlio to determine your disks' throughput capacities, and consider the system's dm_io_virtual_file_stats. Also for WRITELOG, the msdn blog's cause can be identified by looking for excessively "chatty" DML, using a trace that was caught *while* the WRITELOG waits were accruing (and concentrating upon the number of executions per tokenized DML statement). Of course, if the data files, the log files, and the backups were all going to the same physical disk (perhaps a RAID 5 disk, with its parity disk write penalty), WRITELOG waits should not be surprising (and neither would be the SOS_SCHEDULER_YIELD, BACKUPIO, and PAGEIOLATCH_SH). I do not know how to interpret this. Can you help me? Awsome post!!! I love the idea of implementing a permanent table to capture and persist the wait statistics. I'm implementing it right now. One thing has me scratching my head. Is there a reason that increment_id is *not* an identity column? Does adding this to the insert script ignore wait_types that do not have any impact ? Not a big deal. I think I saw that in one of your earlier posts. Still a great post and something I need to start moving toward persisting this data and analyzing it. Need to become more proactive. Enjoying the Tips. Have you tried this command: DBCC SQLPERF ('sys.dm_os_wait_stats', CLEAR);? Yes, that is how your clear the wait stats DMV, however, typically you want to retain this info. I do use it though after making changes/tuning and cutting a final, persisted store of the metadata from the DMV to the physical table. Then, when reviewing the results from this DMV I am only looking at results since the tuning changes that have been made. I do that with the other persisted metadata I've written about here. I'll change the script this weekend and repost. Thanks! Nice post. Since the stats are reset at a restart wouldn't you need to modify the queries that report on your persisted data to NOT subtract the previous entries if there was a server restart between the times you collected the data? You could use the start time for the default trace in sys.traces or the creation time for tempdb from sys.databases.